The power of HEPA. The efficient, lightweight VAS525 Vanquish™ Air Scrubber is ideal for heavy duty restoration or any jobsite where indoor air quality is important. It features a pre-installed Mytee HEPA filter removes at least 99.99% of airborne particles 0.3 micrometers and larger in diameter and the 16″ air intake provides a large particle collection area. The Mytee HEPA filter has a MERV 18 rating. The Vanquish™ Air Scrubber is stackable for maximum coverage, and can also be used as a Negative Air Machine in order to set up negative or positive pressure isolation rooms. It also features an auxiliary power outlet as well as a 12 amp breaker so you can daisy-chain multiple Air Scrubbers together. Use the charcoal filter to remove odors from fire, smoke, fuel, food, and more. Customers who were interested in the Mytee® Vanquish™ HEPA Air Scrubber & Negative Air Machine were also interested in the following items. 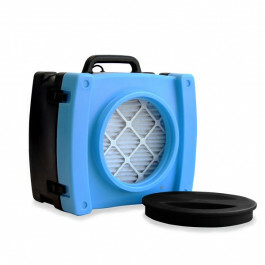 This is a review for the Mytee® Vanquish™ HEPA Air Scrubber & Negative Air Machine .